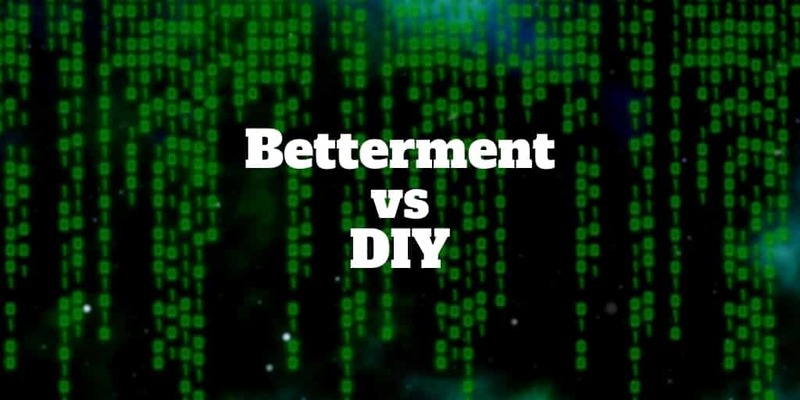 If you are wondering “should I invest in Betterment?”, this review should clear the fog to help you decide between Betterment vs DIY portfolio investments. For an apples-to-apples comparison, we use Vanguard’s VTI exchange-traded fund as our proxy for a do-it-yourself portfolio. Both Betterment portfolios and the Vanguard VTI fund represent diversified portfolios of stocks. Ok, so let’s see who comes out on top! The Vanguard Total Index Market Fund [VTI] is about as good as it gets for any stock market beginner. The average expense ratio of similar funds is 0.95% but the VTI expense ratio is just 0.04%. VTI tracks the performance of the CRSP US Total Market Index, which combines large-cap, mid-cap, and small-cap stocks traded on the NYSE and NASDAQ. Both value and growth stocks are included in the index so it’s about as broad as it gets. Betterment portfolios are highly diversified too because they abide by Modern Portfolio Theory, which aims to maximize rewards for each level of risk. To ensure portfolios remain diversified, Betterment applies portfolio rebalancing free to all accounts. No matter which tier of Betterment service (Digital or Premium) you choose, you can be confident your taxable and retirement portfolios will remain diversified. So you know Betterment portfolios and DIY portfolios (where VTI is used as a proxy) are both diversified to spread risk but what about performance returns? Each Betterment portfolio is built to align with client risk and reward preferences, so returns vary. Betterment claims that, on average, annual returns can increase by an extra 2.66% because of its tax optimization methods that we will talk about more below. The Vanguard Total Index Market Fund returns mirror overall stock market returns. As the stock market soars, so too does VTI and vice versa when it falls. But gross performance returns can be misleading. What you care most about is not the headline percentage gain each year as much as how much you take home after paying Uncle Sam his share of taxes. So who comes out on top after factoring in taxes, Betterment or DIY? To maximize how much you take home, Betterment offers two powerful tax strategies: tax-loss harvesting and tax-coordinated portfolios. Daily tax-loss harvesting is provided free to all portfolios. It involves selling losing positions to offset capital gains taxes, and replacing those losers with similar securities to maintain a diversified portfolio. But tax-loss harvesting only applies to taxable accounts. How do you ensure your tax strategy is optimized across retirement accounts too? The answer Betterment has come up with is tax coordinated portfolios, which places tax inefficient assets in tax-advantaged accounts and tax efficient assets in taxable accounts. The taxes you pay on VTI shares will depend largely on when you sell. VTI dividends are paid each quarter and dividends are taxed when you sell shares. If you choose to sell shares before you’ve held them for a year, they will be taxed at ordinary income tax rates. When you invest with Betterment, you pay two types of fees: management fees and expense ratios. Management fees range between 0.25% → 0.40% depending on the tier of service you choose. Betterment Digital, which is a pure robo-advisor solution, costs 0.25% annually while Betterment Premium costs 0.40% and provides unlimited access to human advice for the additional cost. The average expense ratio charged on Betterment funds is 0.13%. It’s virtually impossible to beat VTI on fees. The VTI expense ratio is 0.04% so you end up paying, on average, a minimum of 0.34% extra per year in fees using Betterment. However, if Betterment can offset those fees each year by boosting returns as much as 2.66% on average as it claims then the comparison is not so black and white. Arguably, Betterment could come out ahead over time. No investment minimum is required to get started with Betterment Digital. To qualify for Betterment Premium, you will need to come up with $100,000, the minimum investment amount. Unlike some other Vanguard funds (VTSAX or VFIAX), VTI has no minimum investment amount. Employer sponsored plans like 401(k)s are not supported – check out blooom if you have a 401(k) and want it managed automatically. As one of the best Vanguard funds, VTI can be placed in most account types. When it comes to asset classes, Betterment and VTI or DIY portfolios are virtually identical in terms of exposure. Neither features much in the way of bonds while both have broad exposure to stocks. ✅ Fees: VTI charges 0.04% annually, which is so close to zero that few funds rival it. ✅ Returns: Depending on whether Betterment can live up to its claims to boost after-tax returns, Betterment returns may eclipse VTI returns. ✅ Investment Minimum: No account minimum is required to invest in VTI, however Betterment Premium has a $100,000 minimum. ✅ Tax Strategy: Betterment has a clear focus on after-tax returns as opposed to a short-sighted focus on gross performance returns only. ✅ Active Investors: If you prefer to have control over how your funds are invested, a DIY portfolio invested in VTI may be preferable. ✅ Account Types: A wide variety of accounts are available from taxable to retirement and even trust accounts. Investors who are focused on gross performance returns net of fees will find VTI a better bet. A do-it-yourself portfolio invested in VTI is also a good fit for investors who like to control how their portfolios are allocated. Betterment is an ideal fit for individuals and joint account holders who want a hands-off investing experience. By focusing on after-tax returns as opposed to gross returns, it is possible that Betterment could outperform a do-it-yourself portfolio over time. For investors who speculate or trade actively, the odds heavily favor Betterment portfolios because few investors beat the market over the long term. The bottom line is if you want to go solo entirely, VTI is a very solid investment but if you want a little hand-holding, an optimized tax strategy, retirement calculators, and lots of other bells and whistles, Betterment is a 5-star investment management service.